I love when Facebook randomly picks old posts to remind me what was. 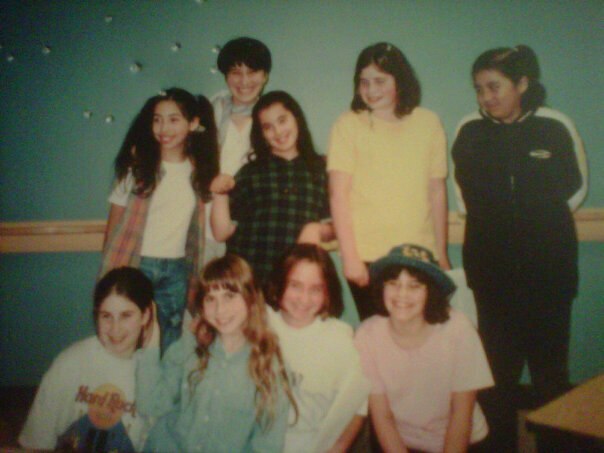 This one came up today – me with my Creative Writing Club from the Simkin Middle School in Winnipeg circa 1998/99. Talk about a sunrise/sunset moment – these amazing girls are now pushing 30, each so incredibly talented and accomplished in her chosen fields. I get to proudly say I knew them when 🙂 . But the picture reminds me of two things: 1) I have always loved guiding kids in creative writing. I say “guiding” (not teaching) because writing about exploring who you are and what you need to say. The beauty of doing that with kids is that they haven’t developed the hang-ups yet that come with trying to write when you’re older and convinced that because you are a bad speller, writing isn’t your thing. At this age (they were in Grade 5) you don’t care about your spelling/grammer/whether-or-not-you-have-any-experience-with-the-subject-matter-you-want-to-write-about. You just want to write. I was a teacher’s assistant in the school. Once a week we met at lunch and wrote based on prompts I gave them. Eventually the girls started working on their own stories. By May they had completed them and we did a coffee house evening where we invited their parents and each student read their piece aloud. I don’t think I’m ever more inspired than when I see kids, who weren’t necessarily writers before, getting turned on by words and stories. But the other thing this picture reminded me of is the importance of community. Writing is so ridiculously solitary. And writers, by nature, are a pretty anti-social bunch. The beauty of a writing group, or writing classes, or an email check-in with a writing partner, is the support and accountability. I remember how these girls cheered each other on, enthusiastically shared their stories as they were working through them, and gave each other encouragement and feedback while they were editing. My online SSM class just finished. I will miss my writing students who came together every week from northern Alberta, Ontario and China. While there’s always something special about meeting face-to-face, this little online space gave us an intimacy which I think is not always found in a bricks-and-mortar classroom. As a TA, I was also welcomed into another writing community with all the other teachers in the program. We went on a retreat (heaven! ), had bi-weekly Zoom conference calls, and now are in touch cheering each other on with our work. As much as I like cocooning this time of year—oh, and the fresh snow makes it so easy to just curl up on my beanbag chair and ignore the outside world!—I’m a much better writer when I’m a part of a community. More inspired, more motivated. Just more. So thanks, FB, for the memory. So glad the lessons from back then are just as relevant now.